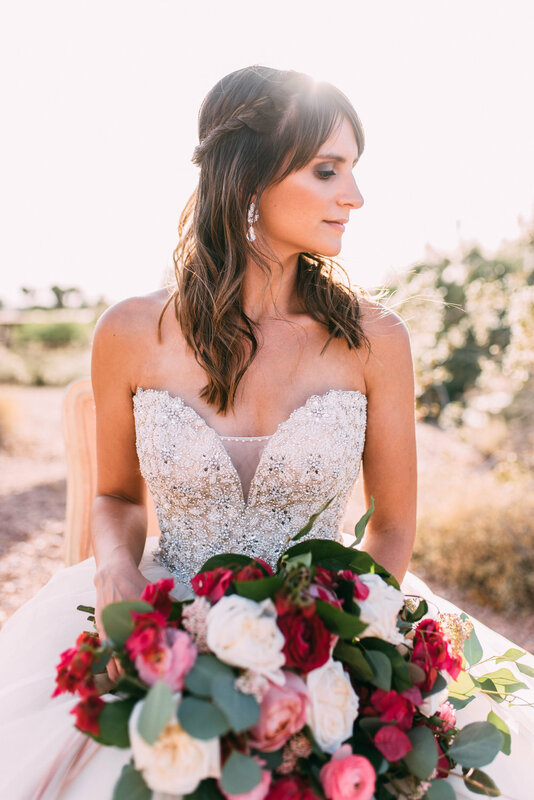 It has been a photographic goal of mine since the beginning of 2017 to create my own styled shoot. How hard could that be? Hahahahaha! Mad props to you amazing coordinators and planners! I didn't underestimate the amount of planning I needed to do - I knew there would be a lot! Maybe I just wasn't as prepared as I thought I was because this was my first one and didn't know what to expect? But I honestly loved it! It was a bit tough managing everything on top of my full-time desk job but I felt so productive and happy to get working towards this. The idea behind my Copper + Rose creative shoot was to create something that would always be mine and something to learn from artistically. I had contacted some local AZ vendors plus one in Seattle and just explained everything I was wanted to do. I told them how I am looking to learn from myself and create content for everyone involved to use as they pleased. I was thrilled to receive so many "yes!" replies! 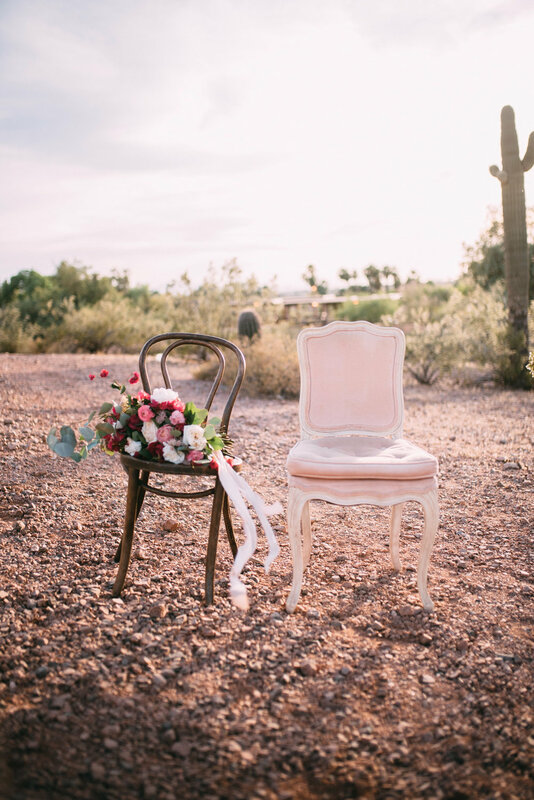 I feel that Blush and Pink hues are here to stay in the wedding industry and will never go out of style. Especially in Spring. However, I knew I wanted to use another accent hue and texture that wasn't Gold. Copper came to me after seeing these terrariums from a TJ Maxx! They were so perfect in their design and what I was envisioning and I just took that inspiration from it and ran with it (I bought them first though). 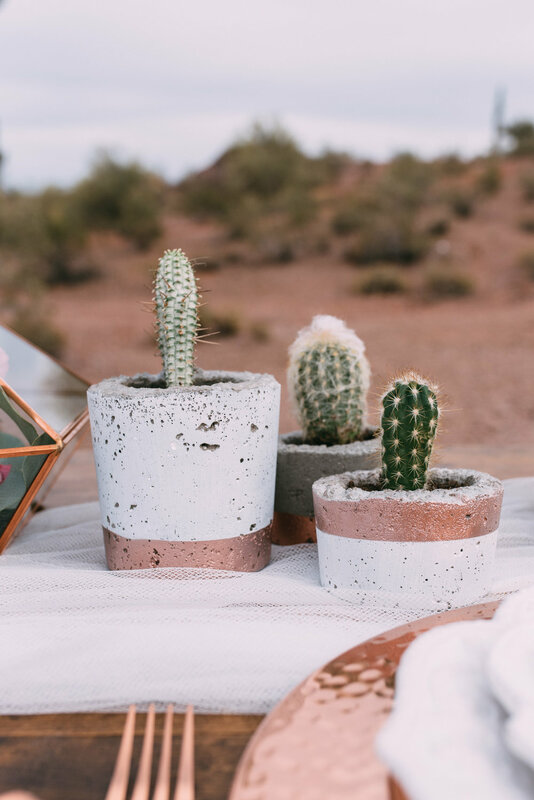 One of my favorite copper details are the concrete potted cactus plants from Crooked Cactus. They are so full of texture and weight and are just so cute! I feel they really brought the tablescape together. Funny story, the cake you see here took a dive into the dirt! Like, majorly! It was such a windy day and it being a cake made of Styrofoam, it literally picked up with the wind and fell off the table! Luckily, Alissa from Serendipity Sweets was still there and jumped in to help fix it! She literally whipped out her palette knife from her back pocket and started reconstructing the icing on the spot. 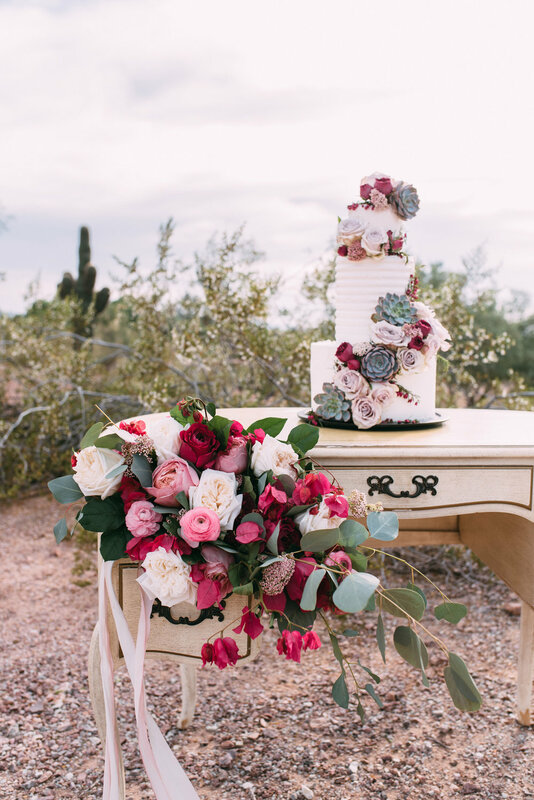 Melissa from Moelleux Events had extra blooms with her and the two of them, never meeting each other before, worked together seamlessly! They made it look new in NO time! I love my friendors and this awesome AZ creative community. 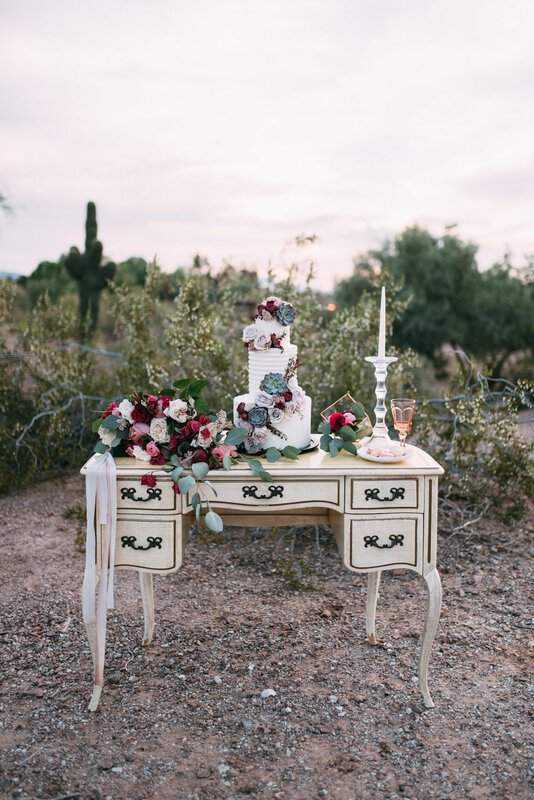 The pink chair and white french dresser both came from my family and provided the perfect setting for the details. 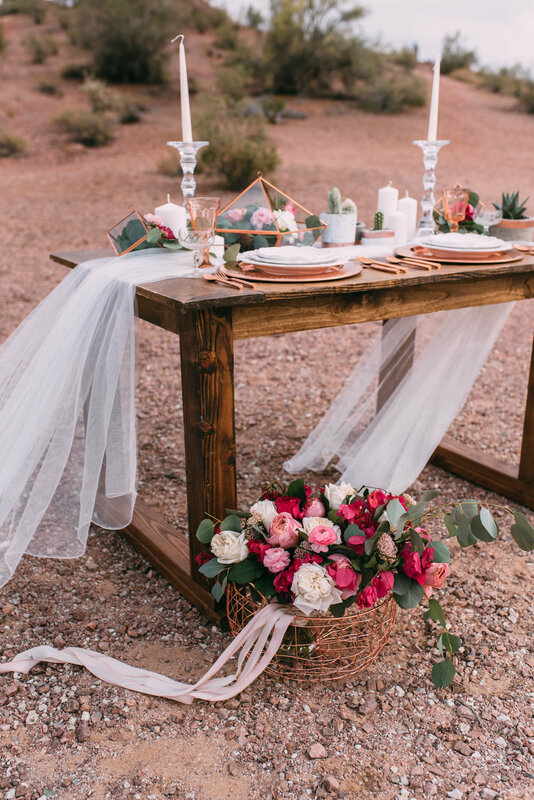 The Farm table and chairs from The Confetti Studio also helped pull together the warmth of the desert and showcase the beautiful hammered copper chargers. Those macarons from Decadent Macaron are to DIE for and taste SO good. Drooling just thinking about them. I am so happy and proud to say that "I FINALLY DID IT!" and I am so excited to finally share these images with you. It's such an awesome feeling seeing my ideas and visions brought to life. I could NOT have done it without everyone involved in this shoot. Like, no way in heck! My heart is so full and I can't imagine a better community of creatives to work with. If anyone is looking for local AZ vendors (plus one in Seattle!) PLEASE contact these wonderful people listed below, you will not be disappointed! I am so grateful for their time and expertise that they so happily contributed to and trusted my idea during the process. I learned so much in this process and definitely can’t wait to put together my next one! I hope you enjoy these images as much as I did dreaming, planning and executing it!